Quebec's only AAA Five Diamond Hotel, The Ritz-Carlton Montreal is the perfect destination for luxurious stays in downtown Montreal. This storied hotel has been setting the standard for luxury since 1912. Plush accommodations blend historic elements with modern features, ensuring a memorable vacation. Indulge yourself with a treatment at the Spa St. James or relax by the indoor rooftop saltwater pool overlooking the city. Steal some quiet time over afternoon tea in the Palm Court and enjoy a creative twist on classic French cuisine at the stylish Maison Boulud. 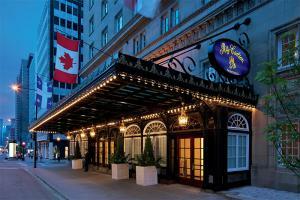 Located a mile from Montreal Symphony Orchestra and 9 miles from Montreal-Pierre Elliott Trudeau International Airport.